Working as a hotel hairdresser can vary greatly depending on the type of hotel and your employment status. 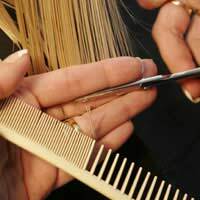 Most hotel hairdressers have gained experience in a private salon prior to working at the hotel, although it is possible to join as a trainee and work your way up. Many hotel hairdressers are actually self-employed and they ‘rent the chair’ in the hotel salon. This means they are in control of their own business, effectively, but it is still necessary to comply with the requirements of the establishment. While you gain greater flexibility and have the potential to earn more, it can also be frustrating to be you own boss without the true freedom of totally Running Your Own Business. If this is the direction you want to head in, the best way to start is to approach local hotels to see if they have a vacancy. This is also a good type of opportunity to gain from Networking, so attend relevant trade fairs (wedding fairs are a great source of suitable hotel contacts). If you are thinking of changing career to become a hotel hairdresser employed directly by the hotel, you’ll need to start by Updating Your CV to reflect your skills as you will have to go through the standard recruitment channels. The large, multi-national hotel brands tend to employ a team of hairdressers to be based in their spa and beauty facilities. These do not usually offer the most cutting edge treatments and styles – they’re more for a cut and blow dry, or styling for a special occasion – so this is not really the job for you if you’re keen on experimental hairdressing. However, some of the trendier boutique hotels may suit you better, but they do not always offer hairdressing facilities so there are fewer opportunities available. Most of the major brand hotel chains have their own recruitment sections on their website, as well as being present on a number of online recruitment sites dedicated to hospitality recruitment. Try looking on these sites before you update your CV and you’ll get a good idea of the latest buzz words to include in your profile. You may also find that the types of job that appeal to you require Additional Training Or Certification, which will give you the chance to take the necessary qualifications in advance. It is worth noting that there are a number of exceptional opportunities to work as a hotel hairdresser overseas. Websites such as the international section of the Caterer highlights large numbers of jobs in exotic locations, with excellent working conditions. Of course, living right next to a glorious sandy beach with year round sunshine may go some way to making up for being away from family and friends, but weigh up the offer before you leap into something. That said, there are often six-month contracts (especially as hairdressers on cruise ships) or longer-term contract with family accommodation and paid-for flights home. Ever dreamed of becoming a flight attendant? Read Our Guide to the pros and cons of this career, including salary expectations, and training and career development opportunities.